This is another small module to measure air pressure, temperature and humidity. Two sensors are on-board: MS5637 and HDC1080. Microcontroller is small cortex M0 in TSSOP-20 housing from STM: STM32F070CxP. The SN65HVD72DGKR provides RS485 interface functionality with half duplex mode. Voltage regulator, reverse polarity protection and some LED indicators are provided on-board. 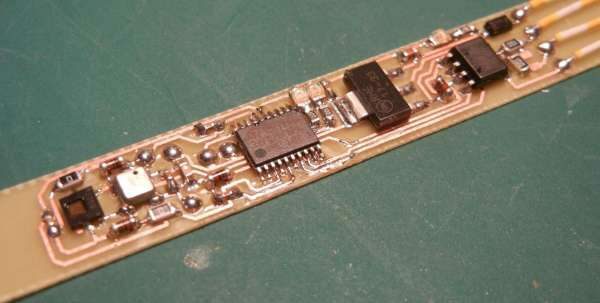 Complete module is 10x55mm, produced on single-sided PCB, easily producible in every home lab with proto-PCB capability. More info at Mare & Gal Electronics homepage. This entry was posted on Thursday, June 16th, 2016 at 1:01 pm	and is filed under PCBs. You can follow any responses to this entry through the RSS 2.0 feed. You can skip to the end and leave a response. Pinging is currently not allowed.